Amber Patrice Riley (born February 15, 1986) is an American actress, singer and author. She is best known for her portrayal of Mercedes Jones on the Fox comedy-drama series Glee (2009–2015). For her performance on the series, she won a Screen Actors Guild Award, and has been nominated for three Teen Choice Awards, three NAACP Image Awards, and a Grammy Award. In November 2016, Riley led the West End debut of Dreamgirls, playing the lead role of Effie White. She won the Laurence Olivier Award for Best Actress in a Musical in 2017 for her role in Dreamgirls. Riley won season 17 of Dancing with the Stars in 2013. In 2017, Riley appeared as a judge on BBC One musical theatre talent show Let It Shine and formed a musical theatre supergroup with Beverley Knight and Cassidy Janson, known collectively as Leading Ladies and signed to East West Records/Warner. Their debut album, Songs from the Stage, was released on November 17, 2017. Riley was born in Los Angeles, California, the daughter of Tiny (née Hightower) and Elwin Riley. She has two older sisters, Toyia and Ashley. Riley auditioned for American Idol when she was 17 years old, during the show's second season, but was turned down by the producers. She graduated from La Mirada High School in La Mirada, California in 2004. In 2008, Riley was cast in the role of Mercedes Jones on the comedy-drama television series Glee, and appeared as a main cast member for all but one of the six seasons—she received guest star credit during season 5. Riley performed numerous solos throughout the series' run, including "Respect", "Bust Your Windows", "Hate on Me", "And I Am Telling You I'm Not Going", "Beautiful", "Bridge over Troubled Water", "I Look to You", "Ain't No Way", "Try a Little Tenderness", "Spotlight", "All I Want for Christmas Is You" and, three days after Whitney Houston's death, performed a tribute version of "I Will Always Love You". She also played Dr. Frank-N-Furter in the episode "The Rocky Horror Glee Show", singing the lead on the song "Sweet Transvestite" to generally positive reviews from critics. For her role as Mercedes Jones, Riley won a Screen Actors Guild Award and received nominations for three NAACP Image Awards and three Teen Choice Awards. Riley appeared at the 2010 MTV Video Music Awards, sang the national anthem at the 2012 Democratic National Convention, and is currently working on a debut solo studio album. She also co-wrote a track titled "Leave a Light On" for British group The Saturdays, which is featured on their album Living for the Weekend. Riley's debut single, "Colorblind", premiered live on April 3, 2014, on The Queen Latifah Show. The song was written by Emeli Sandé, Claude Kelly and Steve Mac, and was released as a digital download on April 8, 2014. The song was also performed by Riley on Glee. In 2015, it was reported that Riley would star in a Christmas television film, her first movie role, and her first acting role, since Glee. In December 2015, she portrayed Addaperle, the Good Witch of the North, in NBC's live performance of The Wiz. In February 2016, it was announced that Riley would portray the lead role of Effie White in Dreamgirls, at the Savoy Theatre in London's West End, beginning performances in November 2016. Riley recorded a number of tracks for Todrick Hall's visual album Straight Outta Oz. In 2017, Riley teamed up with British singers Beverley Knight and Cassidy Janson to form a musical theatre supergroup, known collectively as the "Leading Ladies". Their debut album, Songs from the Stage, was released on November 17, 2017 and features covers songs from Cats, Beautiful and Rent among others. In 2013, Riley won the seventeenth season of ABC's dancing competition Dancing with the Stars. She was partnered with the show's one and only six-time champion, Derek Hough. Riley and Hough tied the record for highest first-week score of 27, received 5 perfect scores of 30, and only received a score lower than 8 one time. Riley is the first African-American woman to win Dancing With the Stars. Semi-finals Jazz/"Locked Out of Heaven"
1In week four, judge Len Goodman was absent and guest judge Julianne Hough filled in for him. 2In week eight, judge Len Goodman was absent and guest judge Cher filled in for him. 3The dancer Hough and Riley chose for the Trio Challenge is Mark Ballas. 4Scores from guest judge Maksim Chmerkovskiy. In January 2014, Riley and her sister Ashley launched a plus-size online clothing boutique, Rileyland Fashions. She also models the garments. 2010 The Simpsons Aiesha (voice) Episode: "Elementary School Musical"
2014 Dancing with the Stars Herself / Performer Season 18, episode: "The Finals Award Show"
2016 Crazy Ex-Girlfriend Dream Ghost #2 Episode: "Josh Has No Idea Where I Am!" ^ a b c Snetiker, Marc (February 4, 2016). "Amber Riley to play Effie in West End Dreamgirls". Entertainment Weekly. ^ "'Harry Potter and the Cursed Child' Wins a Record Nine Olivier Awards (Full List)". Variety. April 9, 2017. ^ "Amber Riley, Derek Hough win 'Dancing with the Stars'". Fox News. November 27, 2013. ^ Ingrassia, Lisa (May 17, 2010). "Glee's Amber Riley: "I Love My Body"". People. Retrieved August 15, 2011. ^ "Glee Star Amber Riley On Idol Rejection: "I Still Work On Fox And Get Paid"". Access Hollywood. September 30, 2009. Retrieved August 15, 2011. ^ "Dish Of Salt: Glee Premiere Party, LA (September 8, 2009)". Access Hollywood. Retrieved August 15, 2011. ^ "Glee Exclusive: 4 Original Cast Members Not Returning as Series Regulars for Season 5". TVLine. June 28, 2013. ^ "TV Review: Glee – "The Rocky Horror Glee Show"". Blogcritics. ^ "'Glee,' Season 2, Episode 5, 'Rocky Horror Glee Show': TV Recap". The Wall Street Journal. Retrieved November 1, 2010. ^ "GLEEks! Kevin McHale & Amber Riley Are Guest Hosting AT40 This Weekend!". At40.com. August 10, 2011. Archived from the original on September 27, 2011. Retrieved August 15, 2011. ^ "Ascap Search Note: Type "Saturdays" under the performer field and click search". Ascap. 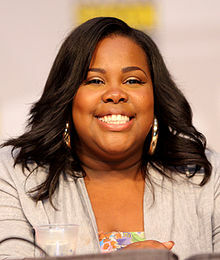 ^ "Glee's Amber Riley Premieres 'Colorblind'". QueenLatifah.com. Archived from the original on April 7, 2014. Retrieved April 3, 2014. ^ "'Glee's' Amber Riley to Star in Christmas TV Movie (Exclusive)". The Hollywood Reporter. Retrieved August 10, 2015. ^ Roots, Kimberly (August 6, 2015). "Glee's Amber Riley, OITNB's Uzo Aduba Join NBC's The Wiz Live". TVLine. Retrieved August 10, 2015. ^ Snetiker, Marc (February 4, 2016). "Amber Riley to play Effie in West End Dreamgirls". Entertainment Weekly. ^ "Todrick Hall Is Straight Outta Oz In This Emotional, Star-Studded Visual Album Featuring Nicole Scherzinger, Perez Hilton, & More! Watch!". PerezHilton.com. Retrieved July 1, 2016. ^ "Leading Ladies: starring Beverley Knight, Cassidy Janson and Amber Rile". londontheatre1.com. November 8, 2017. ^ Derschowitz, Jessica (September 4, 2013). ""Dancing with the Stars": Leah Remini, Valerie Harper, Snooki among new cast". CBS News. ^ "Glee star Amber Riley launches online boutique with clothes from her own closet for her 'curvier fans'". Daily Mail. January 23, 2014. "Artists: Leading Ladies". Official Charts Company. ^ Kheraj, Alim (September 22, 2017). "Albums still to be released in 2017". Official Charts Company. Retrieved September 22, 2017. ^ O'Brien, Jon. "Songs from the Stage – Release Information". AllMusic. Rovi Corporation. Retrieved December 4, 2017. Wikimedia Commons has media related to Amber Riley.